Meet the COOLPIX P7700, a high-performance compact camera with the power and precision to stimulate your imagination. 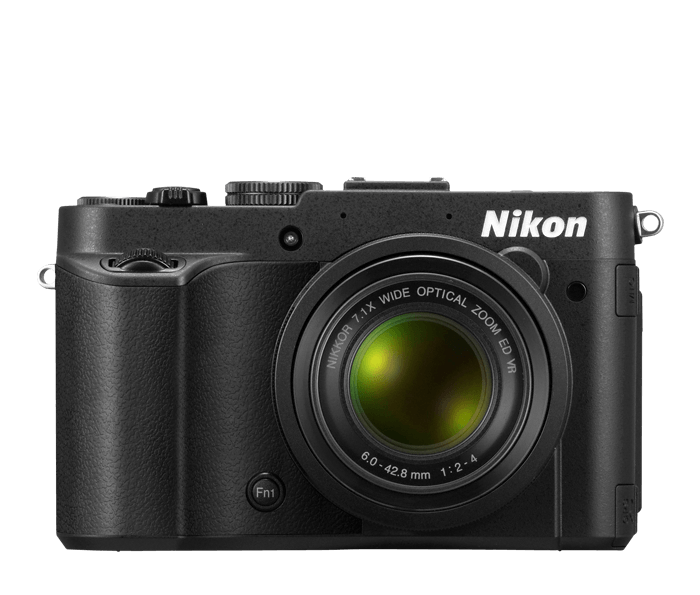 Its extra-large CMOS image sensor is paired with one of the best NIKKOR lenses we've ever put in a COOLPIX camera. Your photos and Full HD (1080p) videos will be second to none. With an Auto Mode you can rely on every time, 19 Scene Modes for getting the most out of every shooting situation, creative in-camera effects, complete PSAM control, RAW shooting and more, the COOLPIX P7700 will go as far as you want to go. For shooters seeking the ultimate compact digital camera performance, COOLPIX P7700 delivers. Great low-light performance starts with the lens, and the COOLPIX P7700 has one of the best lenses we've ever put in a COOLPIX camera. With a maximum aperture that's wider than most compact cameras (f/2.0), the 7.1x Zoom-NIKKOR glass lens gathers maximum light so you can shoot with faster shutter speeds. Combine that with a highly sensitive CMOS image sensor and Nikon's renowned ISO performance, and you'll capture the shots you've been missing—low-light indoor shots, evening group shots around a fire, nighttime cityscapes, fast-moving subjects and much more. When you can swivel your camera's LCD display to just about any position, you're free to explore exciting new perspectives all around you. Hold the COOLPIX P7700 at ground level for a surprising new view of a common scene. In tight, cramped spaces, raise the camera overhead and get the shot or video you need. Every shot you frame, review or share is rendered in 921,000 dots of brilliant detail. When transporting the camera, protect the LCD by flipping it to the closed position. Apply your creativity to videography. With the touch of a button, go from shooting stills to recording Full HD (1080p) videos that can easily be shared on your computer, social networking sites or an HDTV. The COOLPIX P7700 lets you use the optical zoom while recording, so you can frame exactly the shot you want. It also lets you maintain creative control; adjust the aperture and exposure settings, add creative filters, special effects and more. The built-in stereo microphone captures clear, natural audio (it even includes wind noise reduction), but for maximum sound fidelity, add the optional ME-1 stereo microphone. The COOLPIX P7700 is designed to be used—as often as possible. Its compact, ergonomic body lets you create comfortably. All the camera's settings are accessible through easy-to-navigate menus, and key features are at your fingertips. You can even program your favourite settings for quick recall. The COOLPIX P7700 includes a full-size accessory shoe that's compatible with Nikon's most popular D-SLR accessories: Nikon's renowned Speedlights, GP-1 GPS module, ME-1 stereo microphone, and more. Build a creative system around the COOLPIX P7700. *Based on Camera and Imaging Products Association (CIPA) standards for measuring the life of camera batteries. Measured at 23(-/+2)°C; zoom adjusted with each shot, flash fired with every other shot, image quality set to Normal, image size set to 4000 x 3000 (12M). Battery life may vary depending on shooting interval and length of time menus and images are displayed.